If you are new to pfSense and you have just set up a new Box, you won’t have a secure connection to it by default. You probably remember connecting to your pfSense for the first time, that you had to add a security exception. We are going to fix this today and I will show you how to Enable SSL for pfSense 2.4. We want to get rid of this red warning in your Browser and make sure we Enable HTTPS for pfSense 2.4. But before we start, we are going to make sure we are still able to have access to our Firewall in case anything goes wrong and you can’t access the Web Interface anymore. There can be problems if you use older Browser Versions than the ones used in this Tutorial, so we want to make sure you won’t lock yourself out. The User Gert pointed that out in the comments, thank you for this, Gert. 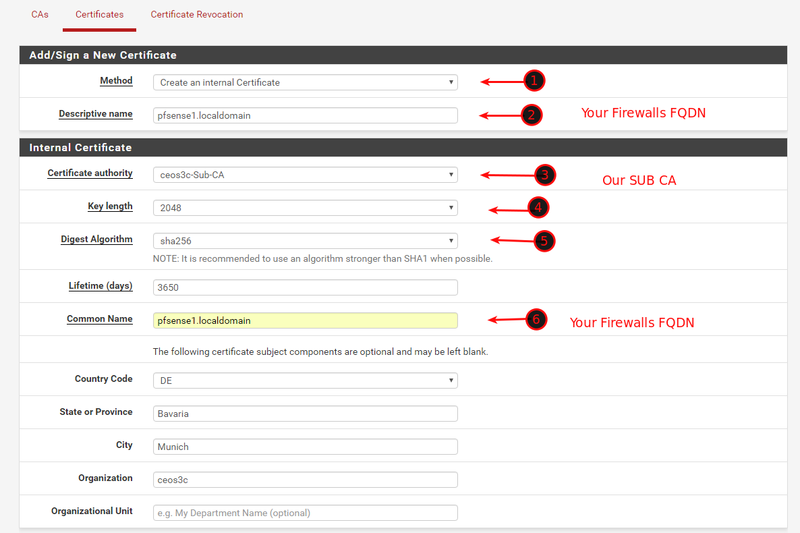 Log in to your pfSense Firewall first. We will create a few security Backdoors in case we get locked out. Further Documentation can be found here. The first thing we are going to do is to create a Backup of your working Configuration. Therefore, navigate to Diagnostics / Backup & Restore. Select as in the Screenshot below and Download your configuration as XML. Now we are going to enable SSH. This allows us to access our Firewall via something like PuTTy in case we can’t access the Web GUI anymore. Navigate to System / Advanced and scroll down until you find Secure Shell. Tick the Box to enable SSH and leave the SSH port on its Default of 22 or change as desired. You can log in to your pfSense via SSH using your Admin Password. Optionally, you can choose to create a Public Key. After we have finished with our Enable SSL for pfSense 2.4 settings, you can choose to disable SSH again if you wish to, although for Home Usage it should be fine to leave it on. In case your pfSense Device has a Serial Port, you could also enable this Port. You find this Option right underneath of the Secure Shell Field. Just tick the Box Serial Terminal to enable it, so you have another way to access your pfSense in case something happens. I recommend leaving this setting enabled anyway, for home use. That should give us enough options to restore our previous configuration in case you experience any problems. Let’s get started with the actual Enable SSL for pfSense Tutorial then, shall we? 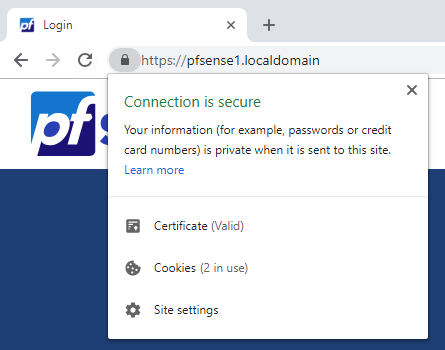 First, we are going to create a new SSL Certificate Authority on pfSense. 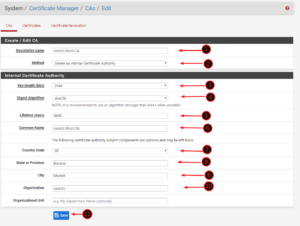 Navigate to System / Certificate Manager / CAs and click on Add. Enter everything as in the Screenshot Below. Add Additional Details if you want to, like your Location. Next, we need to create an Intermediate Certificate Authority. 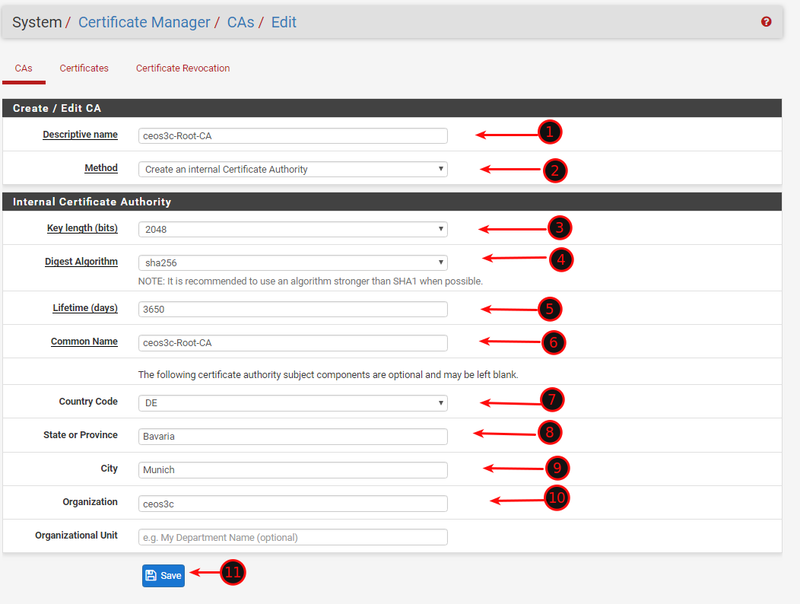 So on System / Certificate Manager /CAs click on Add once again. 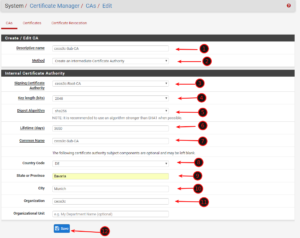 Now click on the Certificates Tab at System / Certificate Manager. 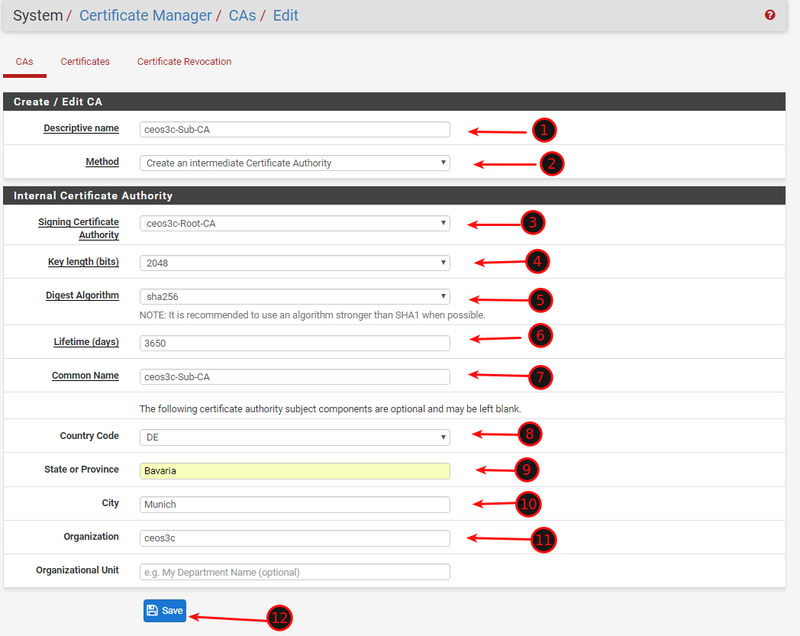 Click on +Add/Sign to add a new Certificate. Fill everything out as in the Screenshot below. Make sure to put your pfSense Fully Qualified Domain Name in the Fields on Step 2 and 6. You can see your pfSense FQDN on System / General Setup under System. Your FQDN is the combination of Hostname and Domain separated by a dot. So if your Hostname is pfsense1 and your Domain is Local Domain, your FQDN is pfsense1.localdomain. This is what you want to put in there. Make sure you put the IP Address of your pfSense Firewall at Step 2 and the FQDN of your Firewall at Step 4. Also, make sure you have Server Certificate selected at Step 1. Navigate back to System / CAs. This is important. Click on Export on both CAs. 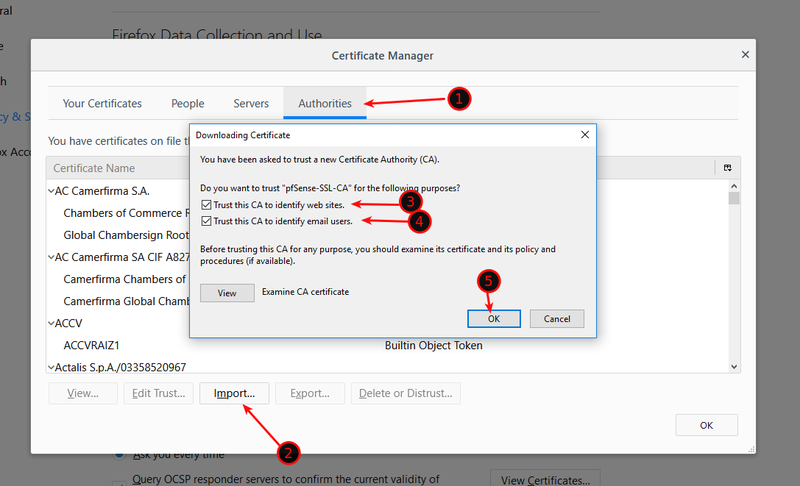 Now there are 2 ways on how to implement those Certificates. It depends on which Browser you use. 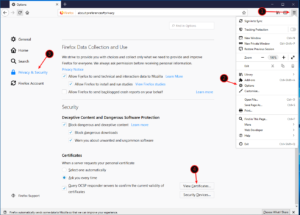 For Chrome, we need to Import both Certificates to the Windows Certificate Root, for Firefox we need to Import the Root-CA only directly into Firefox. I just hope and assume that no one of my readers are using the abomination that is Internet Explorer or even Edge. For Google Chrome, we need to Import the Root-CA to our Windows 10 Certificate Root. 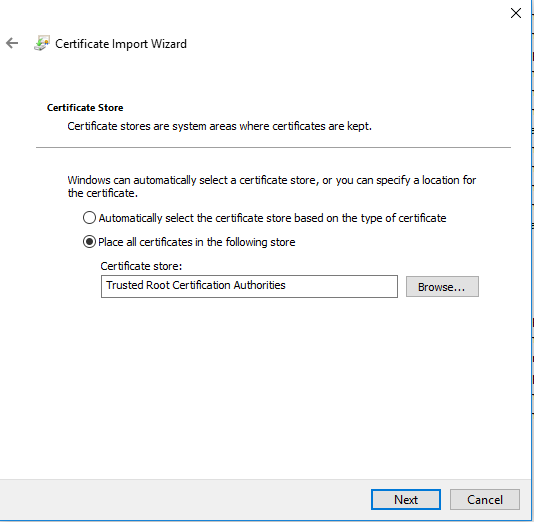 Open your Windows Settings and Search for “Certificate”. 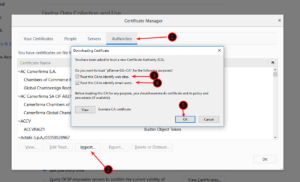 Open the Manage Computer Certificate settings. 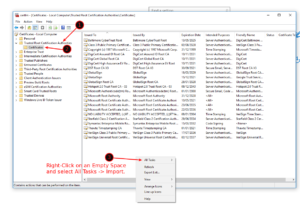 In there, navigate to Trusted Root Certification Authorities / Certificates and right-click somewhere on the right side on an empty space and select All Tasks -> Import. Select the Root CA you downloaded from your Firewall. 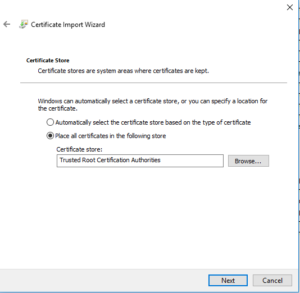 Select Place all Certificates in the following Store: Trusted Root Certification Authorities. Click Next and Finish. 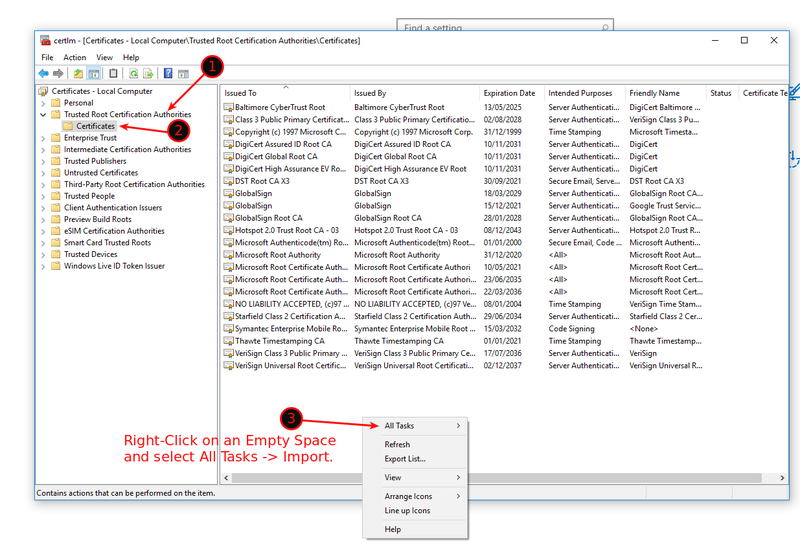 Now navigate to Intermediate Certification Authority / Certificates and repeat the step above, but this time importing the SUB-CA. If you only use Chrome, continue with Step 5. On Firefox, we need to manually import the Root-CA only. To do that, open Firefox and head to Options / Privacy & Security / View Certificates. Click on Authorities and Import the pfSense Certificate from your Downloads folder. Check both Checkmarks. Continue with Step 5 for the last thing we need to do to enable SSL for pfSense 2.4. Log back into your pfSense Firewall and Navigate to System / Advanced / Admin Access. Make sure HTTPS is selected as Protocol and now change the SSL Certificate to the one you have created. Scroll down and click on Save. 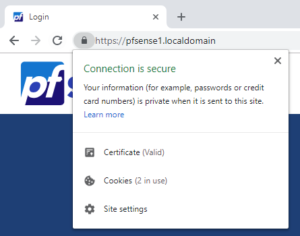 Now, when you restart your Web Browser, you should see a Secure Connection to pfSense when accessing it next time..
Because you have specified Alternative Names in the Certificate, you will be able to securely access your firewall with either the FQDN or the IP Address. See the examples below. As you can see, it works. 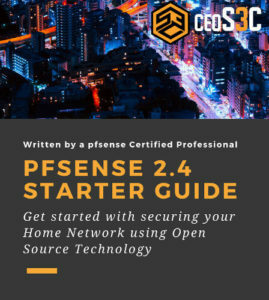 This ensures that you have a secure connection to your pfSense Firewall. Don’t miss out on other pfSense Tutorials and also check my YouTube Channel for a lot of pfSense Video Tutorials! What about Chrome under Mac OS X? I got it to work by just adding the Root-CA to the KeyChain Access app but should it have?!?!? Why did I make a Sub-CA? Thanks. When you get the message such as “SEC_ERROR_INADEQUATE_CERT_TYPE” or some other error, you know that you can access the firewall and fix it. Right now you would be locked out and struggle to get back in if you didn’t. SSH trick is not suitable if SSH is not enabled. Back to serial port access if you have one. Gert, thanks for pointing that out. I will update the guide accordingly. Well, following this article was very frustrating. 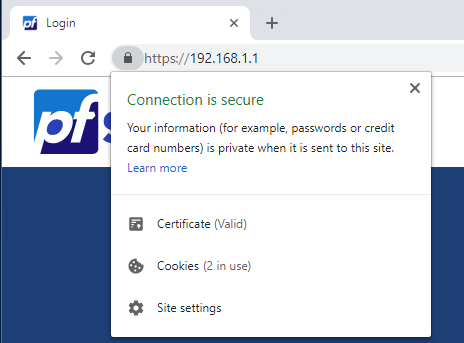 As soon as I swapped the SSL cert and saved, I could no longer get to the UI. Both Firefox and Chrome reported „NET::ERR_CERT_AUTHORITY_INVALID“ no matter what I did. I used several different computers with Firefox, Chrome, and Safari. I verified each time that the CA was correctly trusted, but it still wouldn’t load. I FINALLY was able to get to the pfSense ui up by installing an OLD version of Firefox that let me add an exception to visit the site. Of course I immediately swapped the SSL cert back to the web configurator things worked fine again. Hello david, I need your help here. Can you please mention which version of Firefox? i had to explicitly trust the cert in my laptop. after that it worked. thx for the post! Sorry, it is working in Google Chrome. But not in Firefox. Great you were able to solve it on your own! Thanks for pointing that out, Rob! Changed the guide, works like a charm! Would be better if graphics were in English too? ?